I didn’t leave the house as early I wished (thanks to a Harvard party blasting music past my bedtime), but I still made the priority stop on my list. I was eager to attend the noon session of “Eat Your Words,” where four very different food writers (all female, I will add gleefully) were offering glimpses into their worlds and profession. A good crowd of food lovers (I will not say “foodies” as I’m not so much a fan of the word) converged in the the Boston Public Library’s Washington Room for the occasion. 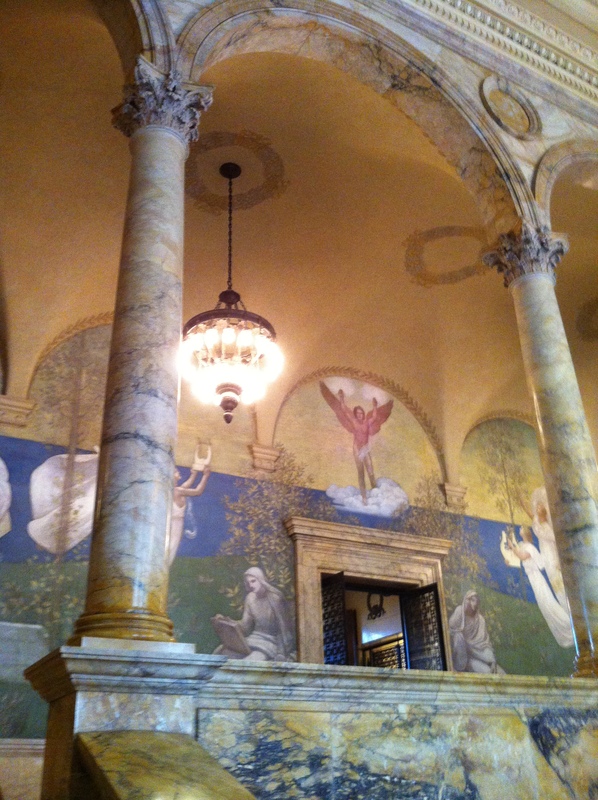 If you’ve never seen the inside of the Central branch’s McKim building, it is, in a word, spectacular. 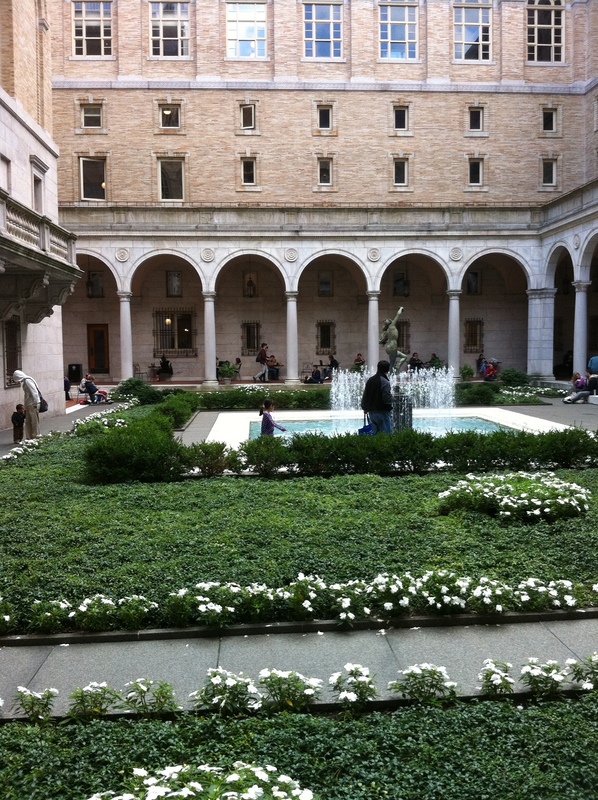 The library was built in the late 19th century in the Italian renaissance style (and includes an interior courtyard). 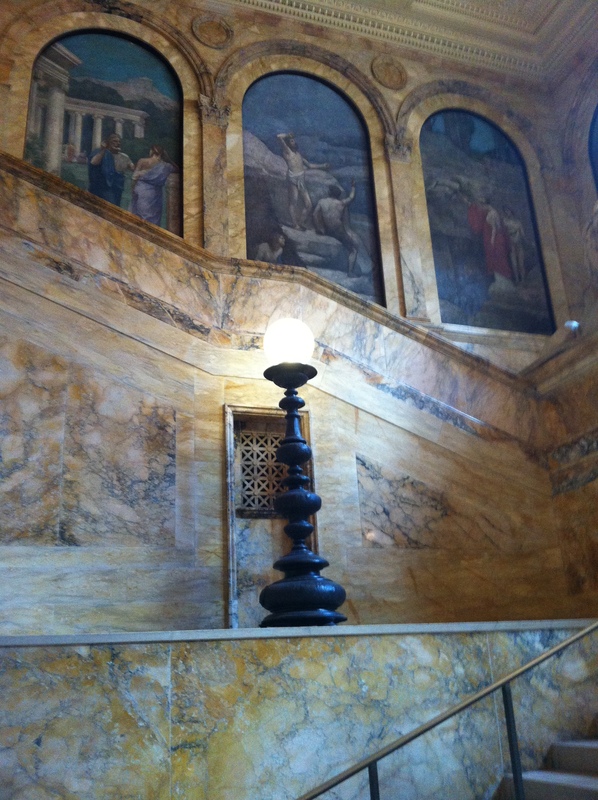 There are several mural paintings (including The Muses and John Singer Sargent’s The Triumph of Religion), monumental inscriptions galore, memorials to regiments of the Civil War, and the Bates Hall reading room (which has 50 feet high ceilings). I couldn’t help but snap a few images on my way in. 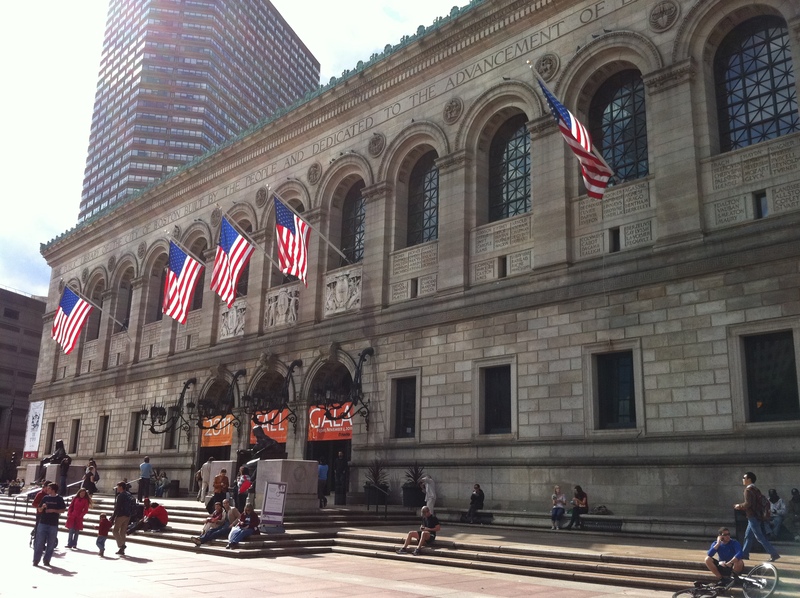 Boston Magazine’s Donna Garlough served as the moderator of the Eat Your Words panel. She briefly introduced the four featured speakers and they were each given about 12 to 15 minutes for remarks. This was somewhat strictly enforced (and very noticeably so, as I sat in the front row next to the volunteer time-keeper with her orange “2 minutes left” cards). For my own selfish reasons, I wish that the panelists were not cut short, because it seemed just as they hit their stride and were sharing interesting and witty anecdotes, they were getting signaled to wrap it up Chapelle-style. Yankee Magazine features editor and cookbook author Amy Traverso began with a brief description of how she fell into food writing. As a journalist she found herself most attracted to the occasional food assignments she landed, and from there, she was hooked. 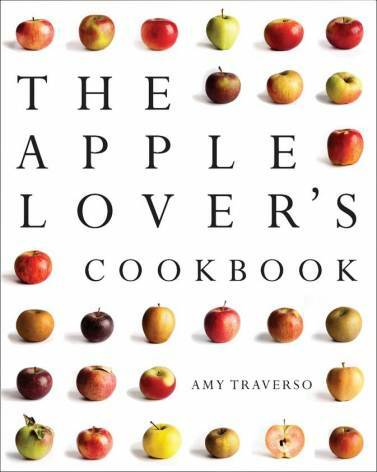 Her first cookbook, The Apple Lover’s Cookbook, which is just hot off the presses, is a tribute to all things apple. Traverso’s enthusiasm for the fruit was evident as she described how her research led her to a deeper understanding of everything from horticulture to world history, culinary history, and recipe development. In The Apple Lover’s Cookbook, 60 apples are divided into four categories: 1) firm/tart; 2) firm/sweet; 3) tender/tart; and 4) tender/sweet. Traverso directs her reader to the category of apple that is the best vehicle for the baked or cooked good of his/her choice. I purchased a copy of the cookbook and can’t wait to try out some of the recipes, including the Sweet Potato Apple latkes (a much-needed makeover for a Hanukkah staple) and Squash Stuffed with Apples, Pancetta, and Walnuts (sounds like a Thanksgiving winner to me). And of course, there are prescriptions for nippy New England weather (namely, mulled apple cider and the invitingly titled Coming-in-from-the-Cold Cocktail). Abend also touched on her recent book and how elBulli became a pilgrimage site for chefs all over the world. Stagaires did everything but trade their first born children for a place in Adria’s kitchen; one South Korean chef traveled to the restaurant and camped out until elBulli finally agreed to offer him a place in the kitchen. Abend was eager to share more, but unfortunately, her time ran out. Following Abend on the panel was historian and cookbook author Joan Nathan, who discussed her latest offering and tenth cookbook, Quiches, Kugel, and Couscous: My Search for Jewish Cooking in France. Nathan credits her previous explorations of Jewish cooking in America and in Israel as key to her treatment and understanding of her present topic. The story of Jewish cooking in France is part of a 2,000 year old tale. As Nathan pointed out, there is no such thing as Jewish cuisine; rather, Jews have learned to adapt local cuisines to Jewish dietary laws. As to be expected, the original Mediterranean Jewish diet consisted of fish, olives, citrus, flatbreads, grains, spinach, scallions, honey, and fruit. According to Nathan, there are currently 600,000 Jews in France (many of which are Sephardi and Mizrahi), making it the third largest Jewish population in the world. Half of this population lives in Paris, but for many years, Alsace-Lorraine was home to the largest community of Jews in France. 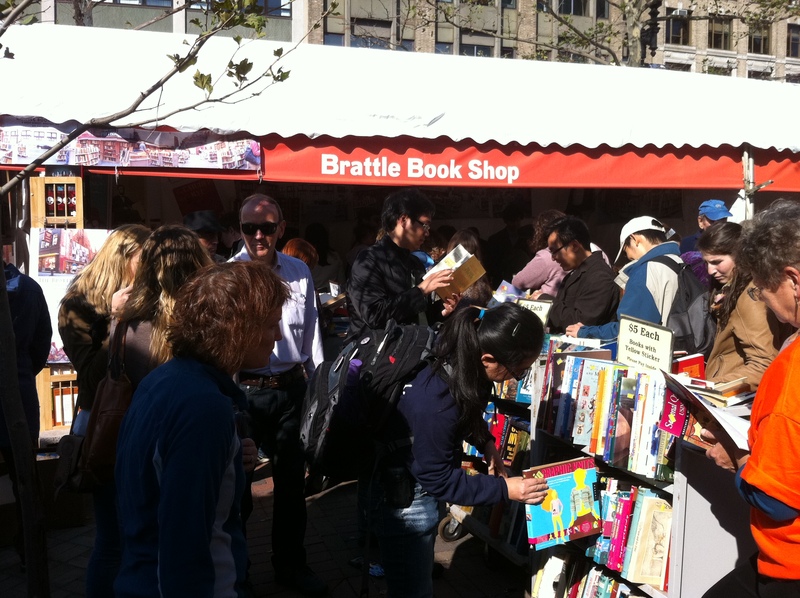 Nathan, who got her start in Boston writing for The Boston Globe about the intersection of ethnicity and cuisine, was aided immensely in this project by her fluency in France and by her French relatives. As she humorously explained (jesting that the French are notoriously “anti-anything”), it is difficult to access people’s “private space” in France, so having the aid of “insiders” was crucial to uncovering the full story and evolution of Jewish cooking in the region. The panel discussion concluded with Anka Muhlstein’s presentation on her culinary biography entitled Balzac’s Omelette. Muhlstein joked that her book contains only the single, simple titular recipe that she didn’t even test, but it is unmistakably food writing. Balzac’s Omelette is about an epochal moment in France culinary history–the birth of France’s great restaurant culture. Although the French novelist and playwright Honore de Balzac was quite abstemious (Muhlstein explained that he was known to work a 16-hour day eating little more than pears, sardines with butter and black coffee, and that he preferred simple foods like fresh garden vegetables and poultry from the backyard; he abhorred sauces), he began writing at a time when restrictions had been lifted with regard to selling food and when the French attitude toward dining out were evolving. Prior to the French Revolution, it was nearly impossible to sell food to the public without violating the many rules and regulations; and although we can’t imagine a time when the French dining scene wasn’t the epitome of refinery, the notion that travelers would go to France for a gastronomic experience was once “absurd.” Although there were inns where one could get a meal, travelers paid for the privilege of sitting at a communal table and had to eat whatever awful fare was served–there were no options. After the Revolution, many remarkable cooks found themselves out of work; their employers were dead or in hiding, and they were free to strike out on their own. The first restaurants were fine dining establishments, but gradually they diversified in terms of atmosphere, price, and menu. Balzac frequented about 40 Parisian restaurants regularly; and the intimate details of menus (some of which listed 28 preparations of veal alone! ), cost, and atmosphere found their way into his novels. Muhlstein characterizes his works as somewhat of a Michelin Guide to nineteenth century dining in Paris. As I am currently reading Michael Steinberger’s Au Revoir to all That: The Rise and Fall of French Cuisine (another great HBS find for a mere $7.99), I look forward to circling back to Muhlstein’s miniature Balzac biography. The panel wrapped up with questions from eager audience members, including one from a “starving college student” (i.e., which one ingredient or tool could revolutionize her home cooking–salt (Abend), preserved lemons (Nathan), a cast iron skillet (Traverso), and a dutch oven (Muhlstein)). The panelists then graciously stayed to chat and to also sign (and sell) books. To learn more about Ferran Adria and the elBulli Foundation (the culinary think tank slated to open in 2014) , be sure to get your tickets for his upcoming lecture at the Harvard Cooking & Science series.